Post here in this thread only tips and tuts please. Use >this other thread< for comments. is a lttle tool from Mister 'Nakashima Tomoaki' for to store more than one item in the clip board. or use the zip archive and just unpack it. - Then start the CLCL.exe. - So you get a "general.ini" which stores all of your settings for CLCL, there are no Registry settings. clip board item of the last days. CLCL can also be expanded by installing some plugins which are available on the page itself. btw, Mr. Nakashima is also the author of nPOP, a tiny but effective POP3 email checker... sorry, off-topic. Change the left/right mouse button action of the tray icon. I'd like to use an left mouse click to open the historie list , instead of the viewer. - choose "View | Options.."
and double click on "Viewer - Click on left...."
Now select in the "Call type"-drop down "Click on right for system tray"
Do the same for the second entry "Menu"
but select "Click on left for system tray"
Now you can access the historie with an left mouse click on the tray icon. The standard hotkey to launch the historie of your recent clip board item is ALT+C. I like to have Win+V to reach this pop-up. and double click on "Menu Alt + C"
In the hotkey field we enter 'Win+V' , i.e. Now we gonna add an new action our self. Now you could create different short cuts for different template-sub-folders. - click on the UP-ARROW at the left bottom to move this new item up... till it's an sub menu of "&Older ones"
Note that this settings are only set for the Win+V pop-up menu. Now you can make a few other sub pop-ups for the clipboard items 19-27 (modify "Older ones"
Be shure to use 9ner steps: 0-9, 10-18, 19-27, 28-36 to be able to access the items by a key from your keyboard. * use "Option", "Cancel" and "Exit" - to add this buttons to your pop-up window. * use "Clipboard Watch" to add an kind off On/Off button. * use "External Application" to add.... well you already guess, right ? Here you can build the look of your items in the pop-up. In the half above you can set the size of the Picture preview and such things. In the "Display format of menu:" you can build the look of your items in the pop-up. %t ---> show the fist few chars of the clip board item. If you add an '&' char in front of %t you can access the item by his first char too. If you delete the number '1' bevor the 'd' the numbering of your item starts from '0'. So your items can be numbered from '0' to '9'. You could access one more then with '1' to '9'. If you like you can use charaters as trigger instead of numbers.. so you have 26 possiblies. Click on the big arrow to see all the possiblies. "If "toggle" is checked, you can click on the tray icon to open the viewer, then click again to close it. If "toggle" is not checked, clicking on the icon opens the viewer, but does not close it." - Second you can set how the (and which) "folders" should be expanded if you open the viewer. - Then with "Display items...." you can set what kind of items should be shown in the viewer. - And with "Default action...." you can decide what should happens if you double click an item. Little Update for Lesson 4 since i was asked in other forums. i set up my pop-up menu's. I go to "Options | Action | Menu Click on left...."
The first 10 items i can reach with the number keys 0,1,2... till 9.
and give this new copy an other hotkey. AND now by pressing the WIN-key and the 'V'-key the same time. * go to "Options | Tool"
Please press on [OK] if you are ready. * and select an Sound you wanna hear, e.g. "C:\WINNT\Media\ding.wav"
So it's only developing error or failure Bambang left. There is no good Search-option in CLCL. Use the shortcut to find next. >>I tried installing the extra tools, or what they are. with the options, and check to see what has changed. >>And the utl dll, what is that for? What formats should it be installed for? for Metafile and RTF clipboard support, respectively. 2) Left-click once on the CLCL system tray icon. 3) This will open the CLCL "Viewer" window. Click "View" on the menu bar, and select "Options". 4) The "CLCL - Options" dialog opens. Click to activate the "Format" tab. 5) Click the "Add..." button. 6) The "Edit of Clipboard Format" dialog box opens. Click the "Browse..." button. 7) Browse to the path containing the DLLs that you downloaded in Step 1. Select the plugin DLL (e.g fmt_metafile.dll), and click "Open". 8) The "Select function header" dialog box opens. Click OK.
9) Click "OK" to close the "CLCL - Options" dialog box. picked up and stored whenever it is available on the clipboard. DLL that you wish to add. tools do is given below. 4) The "CLCL - Options" dialog opens. Click to activate the "Tool" tab. plugins are configured on the "Format" tab. 6) The "Edit of Tool" dialog is displayed. Click the "Browse..." button. Select the plugin DLL (e.g tool_text.dll), and click "Open". cannot select multiple tools in this dialog. 9) Click OK to close the "Edit of Tool" dialog. 10) Repeat steps 5 to 9 to add more tools. all contained in the same DLL. since the tool will perform its action on the currently selected item(s). Here is a small explanation of what each tool does. 1) To &Lower – Converts the text in the selected item(s) to lowercase. 2) To &Upper - Converts the text in the selected item(s) to uppercase. the text in forwarded emails / quoted newsgroup posts. in the selected items into. 1) Clear &History - This tool will delete all History items. will be saved, and also specify the naming convention of the saved files. other windows even when some other window is active. Viewer window, if it was previously set using the "Always on &Top" tool. Type" section. For example, checking "When data is added to h&istory"
> clips (rtf, ms-word, html)? Open the viewer, and select View -> Format on the menu bar. A '+' sign will appear to the left of each item in your History list. clipboard formats that are available for that item. entry named 'TEXT' and press Ctrl + C (or right - click and select 'Send to Clipboard' ). that is launched when you click on that item. You can do this from the 'Action' tab of the Options dialog. up, select 'Menu' from the 'Actions' combo box. Application' from the 'Content' combo box. items. To create a pop - up menu select 'Pop-up Menu' from 'Content'. You have many options with which you can invoke the menus you create. can be specified in the 'Hotkey' box just below the 'Call type' combo. 2) Ctrl + Ctrl - Menu is displayed when you tap the 'Ctrl' key twice quickly in succession. 3) Shift + Shift - Menu is displayed when you tap the 'Shift' key twice quickly in succession. 4) Alt + Alt - Menu is displayed when you tap the 'Alt' key twice quickly in succession. 5) Click on left for system tray - Menu is displayed when you left click on the CLCL system tray icon. double click using the left mouse button on the CLCL system tray icon. 7) Click on right for system tray - Menu is displayed when you right click on the CLCL system tray icon. double click using the right mouse button on the CLCL system tray icon. I can't remember where I found out about Nakashima Tomoaki's CLCL, but I do remember that I was sufficiently taken by the idea of a program that remembers a list of everything I copy onto the clipboard, whether it be snippets of text or whole files, that I downloaded and installed it straight away, and I've been using it every day since. A few months later I was able to get it set up to act as a quick launcher too, and I use that every day as well. Despite being so useful, some of the installation instructions took me a while to work out (which explains the few months gap I just mentioned), so I thought I'd lay out here what I did to get this excellent program working. First, and unsurprisingly, you need to download it. I got my copy at http://www.nakka.com/soft/clcl/index_eng.html. Download clcl112_eng.exe (or one of the other language variants, if they're a better match for you than English). While you're there, also download the two tool plug-ins, tool_text and tool_utl, and the three format plug-ins. Now run clcl112_eng.exe. It's an installer, and by default unpacks into C:\Program Files\CLCL. You should find you've now got four new files: readme.txt, CLCL.exe, CLCLHook.dll, and CLCLSetup.exe. 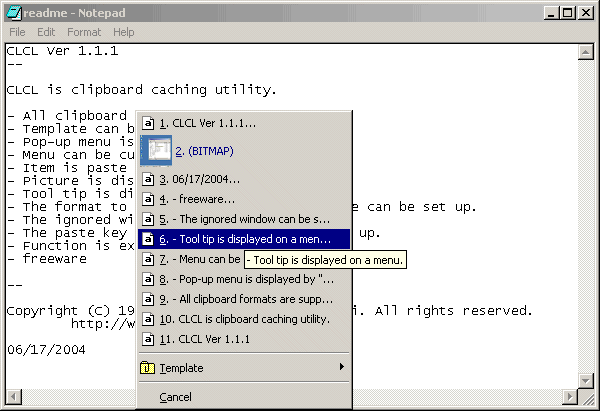 CLCL.exe is the clipboard program. It needs to be manually launched, so I put a link to it into my Startup folder under the Start menu. If you run it now, you should notice a paperclip icon appearing in the taskbar. This is a shortcut to CLCLSet.exe. CLCLSet.exe is a bit confusing. If you double click on the file icon in C:\Program Files\CLCL, it will bring up the CLCL Options dialog. However, if you click on it in the taskbar, you get the CLCL viewer instead. Also, if you right click on the paperclip icon, you get a pop-up menu containing the clipboard history, the Options dialog, and the viewer. There are endless ways of configuring CLCL, so I will only describe what I've done with it. I find this works flawlessly (for me), so hopefully it will for you too. Run CLCLSet.exe to get into the Options dialog. Set 'Action' to 'Menu' and 'Call type' to 'Alt + Alt'. In the 'Menu' area, click on the line marked '(New content)'. Don't be put off by it being greyed out. Now click on the 'Content' dropdown, and select 'History(Ascending)'. You should now find that pressing ALT twice in quick succession will bring up a menu containing a history of everything you've put onto the clipboard since CLCL started running (and this history is retained from session to session). Set 'Action' to 'Menu' and 'Call type' to 'Shift + Shift'. Now click on the 'Content' dropdown, and select 'External Application'. Fill out 'Title' and 'Path' for an application of your choice; e.g. 'Python 2.5' and 'C:\Python25\python.exe'. Pick the executable for 'Icon path' too. You have now added a quick launch for Python 2.5. Pressing Shift twice in quick succession should bring up a menu containing 'Python 2.5'. Clicking on '(New content)' also allow you to add several other useful features, such as 'Options', 'Cancel', or sub-menus (via 'Pop-up menu'). I mentioned the CLCL viewer, that comes up when you left click on the paperclip icon in the task bar. The main use I make of this is to edit the contents of the clipboard. Earlier on I said to download two tool plug-ins, tool_text and tool_utl. The tools inside them let you perform a variety of actions on selected text, such as wrapping in quotes, changing case, etc. I will now explain how to install these tools. The download will give you two zip files. Unzip these and you should find a DLL in each one. There is also the source code and a text file, but these can be ignored. Move the DLLs to a sensible location, such as under C:\Program Files\CLCL. Now bring up the CLCL options dialog again. Pick the Tools tab. Click on the Browse button and select one of the DLLs. Then select the first tool in the list that appears. Click OK twice to get back to the main dialog. Repeat this until you have added all the tools in both DLLs. I'm afraid that I have not found a way to import all the tools in a DLL in one go. To use these tools, go back to the instructions for setting up a quick launcher. Where it asks you to select 'External Application', select 'Tool' instead. In this way you can add the tools to your menus. As well as the tool plug-ins, there were three format plug-ins. These will extend the range of formats available to CLCL, and to install them you have to perform these steps. Unzip the downloads. Take the DLL in each one and move it to a suitable folder, such as the same one you put the tool DLLs into. Bring up the CLCL options dialog. Pick the Format tab and click on the Add button. Now click on the Browse button and select one of the DLLs. This will bring up another dialog containing a list with one item in it. Select that item and then press OK twice to get back to the main dialog. I hope these instructions prove useful to someone one day. Looking through the options dialog, I realise that there is plenty of stuff I still don't understand. The Window tab in the options dialog is a complete mystery, for instance. If anyone can illuminate that, or any of the other bits I've left out, please let me know and I'll add them to this guide. Page created in 0.046 seconds with 51 queries.